Sri Lanka, how easily it rolls off the tongue. Ceylon until 1972, before that Taprobane and also Serendib where the word serendipity comes from, meaning to find something wonderful unexpectedly. Sri Lanka is truly a magical island. Hanging like a baroque pearl at the bottom of India. To the West is the Arabian Sea, to the East, the Indian ocean, and to the South the first land mass one would encounter is Antarctica. 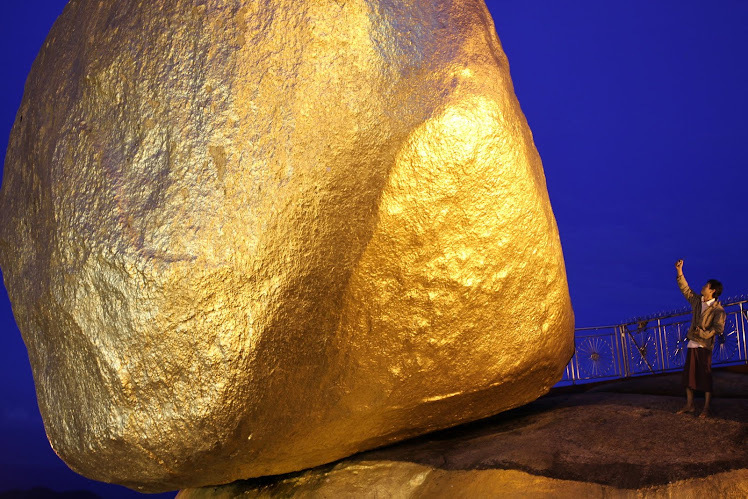 In the south-central part of the country are the towns of Balangoda, Pelmadula and Ratnapura, literally Gem City. All are geologically rich gem areas yielding hexagonal crystals of sapphire in every color, stars, catseyes, zircons, spinel and garnets. Much of this gem crystal has been washed away from the primary sources by millions of years of monsoon rains into rivers which, over the course of time, have shifted direction and left the alluvial water tumbled stones in gem bearing gravels called illam which are the sedimentary gem gravels. From this illam stones are mined. King Solomon was said to have gotten his gems here as he wooed the Queen of Sheba. Marco Polo describes this gem land in his travels. Sinbad the Sailor was lifted high into the air by a giant bird called the Roc which left him in a deep valley with walls so steep he could not escape. This valley was filled with rubies. Gem merchants threw fresh meat into this valley where no man had ever set foot. The meat rolls over the precious stones which stick to them. Eagles pounce on the meat and carry it away in their claws to their nests. The merchants run to the nests, frighten away the eagles and collect the rubies. Sinbad thought that he would never get out of this valley, but then he had an idea. He gathered the biggest rubies and filled his pockets. He went to the largest piece of meat in the valley and tied himself to it. An eagle came, picked up that meat in his strong claws and took him away to the mountain top and left Sinbad in his nest. Sinbad escaped the eagle's nest and in this way made himself rich. 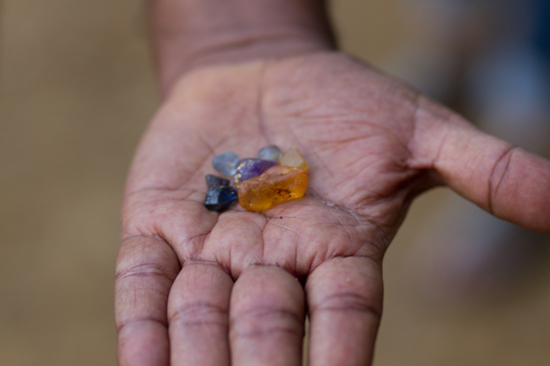 Sri Lanka has an abundance of gems. In fact, Sri Lanka has the highest density of gems (compared to its landmass) in the world. Earlier this year in August, I decided that I should get back into doing one of the few things I was really good at, gems. We traveled back to Sri Lanka to re-establish old contacts and become involved again in the business. I first came to Sri Lanka in 1980 and met a very influential man and his father, both of whom were land owners and gem miners. At that time the influential man's son was an 8 year old boy in short pants. The grandfather built a beautiful ginger bread house with carved eves and moldings high in the foggy hills of Balangoda in 1924. Human bones of Homo Habilis found in caves near here prove that Balangoda has been inhabited for 70,000 years. I was in Colombo, the capital of Sri Lanka in July 1983. In the north of the island near Jaffna, a Hindu Tamil girl had apparently been raped by a Buddhist Singalese soldier. In reprisal, a convoy of Singalese soldiers was ambushed and 13 were killed. In revenge, the Singalese went on a killing rampage in Colombo, hacking Tamils dead in the streets, burning Tamil businesses, some of which had employed them. I saw a bus which had been petrol bombed with people at the windows screaming in flames. Horrible. That smell of burning flesh never leaves your nostrils. The killing spree went on unabated for 4 days and nights without intervention. This was the beginning of a civil war which would last 26 years and claim at least 100,000 lives. The war was only ended in 2009. The young son had moved his family away to Australia after a bomb had exploded near his family. They left for a few years to escape the violence and had only just moved back to Sri Lanka. So, when I came back here to re-establish myself in the gem trade, the timing could not have been better. The cut and polished end of the gem business had lost its allure for me. The stones that I was interested in, the really fine natural fantastic beauties that I loved buying and selling had become difficult to obtain and prices doubled and redoubled with new players coming into the market such as the Indians and Chinese flush with cash. Demand far out-striped supply. Meeting the younger son's children, I had now known the family for 4 generations, and was in a sense a part of it. Mining is exciting. It is the most exciting aspect of the business. You never know what the earth will release to you. 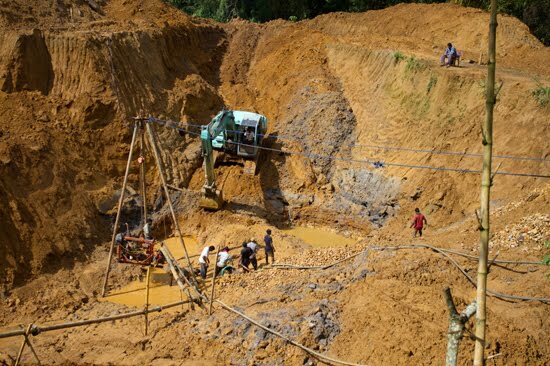 Much of mining is luck, and my luck has always come from the earth. The son introduced us to two of his partners from the nearby town of Pelmadula. 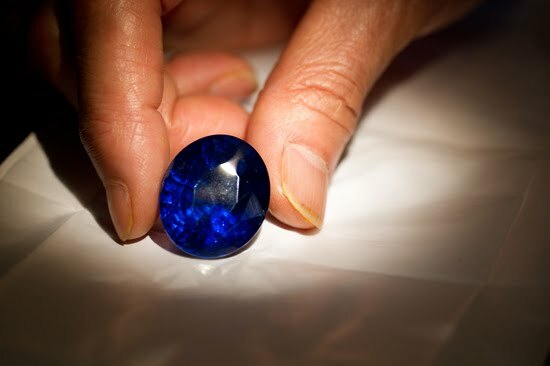 They were young men of great luck who had uncovered 10 million dollars worth of sapphire crystals when they had excavated the foundations of their house. In September, we all traveled together to Hong Kong for the Gem Show to view stones and develop a common gem language of color, beauty and what constitutes value. The slightest difference of hue can mean thousands of dollars of value and spell the difference between success and failure. In October, my wife and I had been in Japan and only returned to Thailand in early November when Bangkok and our house was threatened by floods. Our house manager and other friends laid sand bags, as did most businesses and residences in central Bangkok to protect from possible floods, which had already inundated outer Bangkok with water up to 2 or 3 meters. By late November central Bangkok had been spared from the worst, and by early December we removed the sand bags to the shed, and returned to Sri Lanka. We woke up to the sounds of Buddhist chanting, rhythmic and continuous from somewhere far below the hills we were on top of in Balangoda. I pushed the mosquito net open and looked at the river down below which was swollen from yesterday's rains. From the verandah we are surrounded by fruit trees, jackfruit, guava, mango, and bananas. Birds flit through the branches like living jewels, orange, yellow and red. Some birds are so thick and fluffy as if covered in fur rather than feathers. Groups of macaques come to forage fearlessly and stare back at us. Then the drums begin. It is a full moon tonight and there will be an eclipse. The dogs came in tonight after being outside by the river. Small pools of blood glistened on the white tile floor where thick grey leeches which had attached themselves to their paws, inch across the floor and looked for a way back to the foliage. A gecko on the ceiling, walking upside down, lunged at a luminous firefly but missed. We drove out of Balangoda in the Landrover where many prehistoric monitor lizards scampered into the jungle. A long cobra slithered away. We stopped near a water fall below which were narrow terraced mud rice fields which we slowly walked over toward a river. Occasionally crystals of sapphire, blues, yellows, pinks, violets and the rare orange could be found on the banks of this river after heavy rains. Huge circular wrinkled indentations showed where wild elephants came to forage at night. The miners had built a rather large concrete box shaped structure with a pit in the center which they jumped into and hid when challenged by marauding elephants. When the elephants trundled back into the forest, the miners raised themselves out of the pit with the help of over hanging branches. 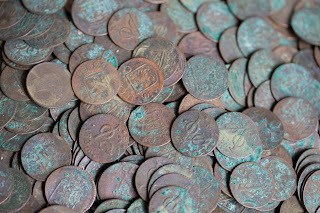 Back in Balangoda, I showed my partner an old Dutch coin that I kept in the coin pouch of my thick ostrich skin wallet. I bought the coin in Colombo and it was dated 1791 during the time when the Dutch occupied Ceylon. 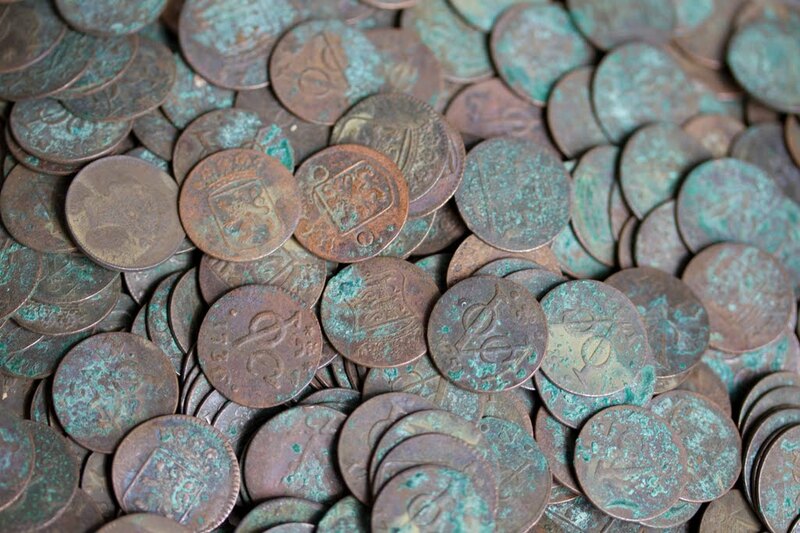 My partner said that his father had dug up a clay pot with many coins like this and he wanted to show them to me. From the safe he brought out a bag weighing several kilos which he poured out jingling on to the table. They were all dated from the early 1700's to the late 1700's, the newest dated 1789. Many were covered with a green patina so thick that the dates couldn't even be read. 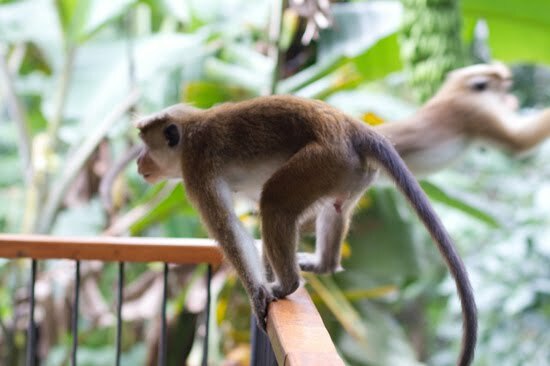 Late in the afternoon the marauding band of macaques swing through the trees, jump on the verandah upstairs and try and force open the doors of our bedroom. The sky explodes with thunder and rain as black as steel and make over ripe jackfruit, thorny and rotten red at the stem, drop to the ground with a mushy thud like swollen basketballs. Early the next morning I noticed that there had been a migration of thousands of pure white egrets which had all landed together about a kilometer from here. Looking out at them, it was as if the jungle had been covered with snow.